Throughout the Bible, the God of Abraham, Isaac and Jacob is portrayed as a Shepherd who leads His people, provides for them, takes care of them and loves them. My question: Do YOU know this Shepherd? Who do you think He is claiming to be? HE IS SAYING HE IS GOD! Does He know you? Do you know Him? 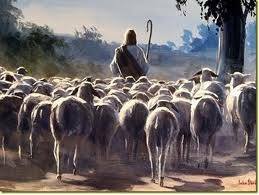 Muslims will quickly point out that Jesus came for the lost sheep of Israel. That is true. That only strengthens the claim that Jesus is the God of Abraham, Isaac and Jacob, present in the flesh, in the world to call His people Israel back to Him. However, that is only half the picture. Who are these OTHER sheep? It is the rest of the Gentile world. That includes you and I. Do you hear His voice? Do you follow Him? Do you have eternal life that Jesus gives?